One of the many effects of the Mexican Revolution was nationalism. At the beginning of the Mexican Revolution, Father Miguel Hildago and Costillo preached the Grito de Dolores, which is to this day quoted by many Mexicans on their Independence Day. To the left, you can see how many people thought that the Grito de Dolores was the symbol for the Revolution. At the end of the document it says, " ¡Viva, pues, la Virgen de Guadalupe! ¡Viva la América por la cual vamos a combatir! "(1) This translates to "Live then the Virgin of Guadalupe! Live America, for which we will fight!" As you can see this document was very motivational for the people at that time. You can even see from the picture that all the social classes were united and yet divided by this speech. They are united because they all want freedom, but they are separated in that they want freedom from each other. This kind of nationalism proved to be the countries downfall. From the Mexican Revolution individuals revolted against the monarch but also each other. The Grito de Dolores is an important primary document that shows us what people were thinking at the time. Unfortunately, because it has to be translated some nuances and idioms could be lost in translation. 2. 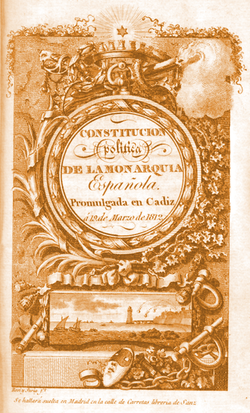 La Constitucion De Cadiz Del 1812. 15 Mar. 1812. The First Mexican Constitution.